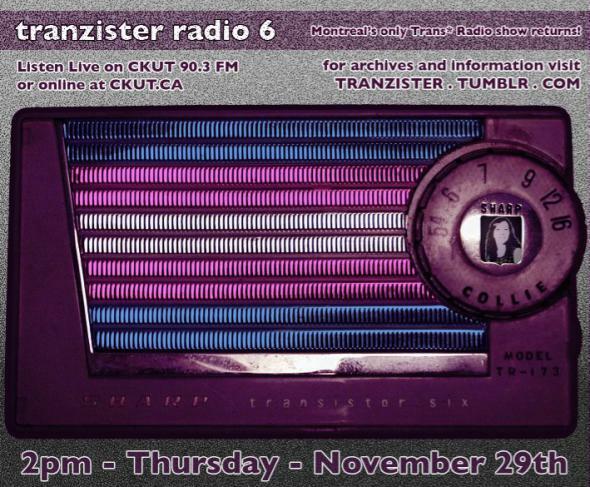 We’re oh so excited to announce that Tranzister Radio will be back on air this Thursday November 29th (2-3PM)! Tranzister Radio says: Join us for smooth afternoon radio with transgender people, talking about stuff.. trans* stuff. The show will feature exciting special guests: Mirha Soleil Ross (Artist, Performer and coordinator of ASTTEQ’s Anti Violence Project), Andrea Clegg (Author of Newsgirls) and Mason Mccoll (Toronto based Aids Activist).